The Wignacourt Arch in Fleur-de-Lys. The building of a replica Wignacourt Arch in Fleur-de-Lys is on hold pending a decision on a tender appeal. 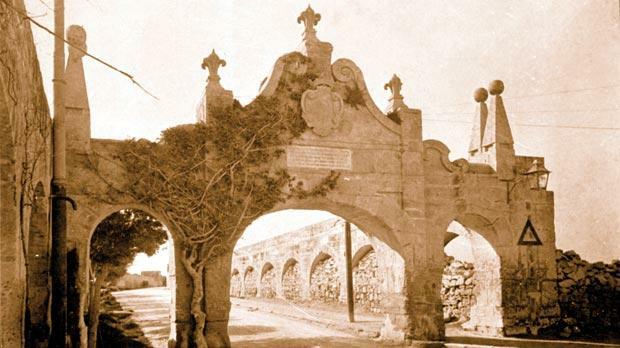 The arch will be built on the roundabout between Mdina Road and St Joseph High Street, 70 years after it was pulled down. The €280,000 project, funded by Bank of Valletta and the Government, was given the green light by the planning authority last October. Resources Minister George Pullicino said yesterday everything was ready for the project to start once the tender appeal case was sorted. The work should be completed within six months. The arch would serve as a monument to Grand Master Alof de Wignacourt, who had sponsored the aqueduct to channel water from Rabat to the capital. Mr Pullicino said it would also honour the Dominican engineer Bontadino de Bontadini, who had built the 15-kilometre long aqueduct and the 600 Maltese that worked on the project for five years. Finance Minister Tonio Fenech explained BOV would be forking out €100,000, €40,000 would come from the Good Causes fund and the rest would be funded by the Government. Antoine Attard, from the Fleur-de-Lys administrative committee, said the arch had been demolished when a Royal Air Force crane and a War Department truck crashed in it in the space of 10 months between 1943 and 1944. It sported Grand Master de Wignacourt’s escutcheon and three carved fleur-de-lys, which gave the name to the locality.